<!-- missing image http://blogs.kcrw.com/goodfood/wp-content/uploads/2015/10/This-is-Camino-246x300.png -->Known as the “ninja of California live-fire cooking,” chef/owner Russell Moore and his wife/co-author, Allison Hopelain, bring to life the heart of what their Oakland-based restaurant, Camino, has to offer: straightforward seasonal cooking at its best. Whether you’ve been or not, these are the dishes that you can—and will want to—cook at home for yourself and the ones you love. 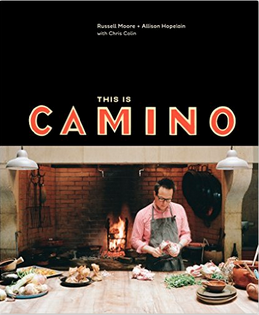 The recipes in This is Camino capture the honesty of Russell’s unconventional approach to cooking and running a restaurant that begins with his live-fire cooking in Camino’s cavernous communal dining room, where family-style sharing is always encouraged, to no tipping. Formality aside, even his menu inspiration often takes the form of happy accidents and experimentation, as with his recipe for Grilled Endive with Fresh Turmeric and Walnuts (below). There is just one little moment of trickiness with the sauce: the garlic and fresh turmeric should sizzle and cook in the hot oil without browning—or, even worse, burning. If you keep a glass of water within reach, it should be no problem. A splash of water helps cool down everything, while also dispersing the turmeric flavor and color. Build a fire to grill the Belgian endive. For the walnuts: Preheat oven to 350°F. Spread the walnuts on a baking sheet and toast them in the oven until they turn a shade darker, about 8 minutes. Once cooled, wrap them in a dish towel and rub to remove some of the skins. Chop coarsely and set aside. To make the sauce: Heat a small pan over medium heat. Add enough olive oil to coat the bottom of the pan, then add the garlic and turmeric and immediately stir or shake the pan so that the garlic and turmeric sizzle. The turmeric and garlic should spend just a moment or two in the hot oil because you don’t actually want them to brown at all. Once they have sizzled for a few seconds, add the nigella, give the pan another quick stir, and add a few tablespoons of water. The whole thing should bubble for another few seconds, and all the liquid will turn bright yellow. Pour the contents of the pan into a bowl, using a rubber spatula to get as much out of the pan as possible. Add a pinch of salt and allow everything to cool briefly. Then add the walnuts and another couple tablespoons of oil. Set aside. To grill the endive: Rake the coals under the grill for medium-hot grilling. Remove any brown or wilted outer leaves from the endive heads and cut them lengthwise into quarters. Brush all sides with olive oil and sprinkle with salt. Depending on the size of the endive, they should take 12–15 minutes to cook. Grilling Belgian endive can be a little challenging because it’s fairly dense and a little sweet, so it tends to brown rather quickly before cooking all the way through. Without looking pale and gray, your endive should should still have a little bit of crunch, but not a lot. To achieve this, your endive should be grilled mostly open-side down so that the heat will reach the interior. Too much time spent on the leafy side will cause it to brown too quickly. You should also check when you first turn them to see how quickly they are browning. You can always move the endive to a different section of the grill if they are browning too quickly or too slowly. Or, if you are using a grill with some access, like a Tuscan grill, you can spread the coals out more thinly or pile them beneath the vegetables. Remember, if you pay attention, you can control everything almost immediately on a grill by moving the coals. One more note: The endive will look best if you have one clean set of grill marks on each side. To get this effect, carefully lift them just a little to peek for grill marks and readiness, without actually removing them completely from the grill. Try not to move them around too much once you’ve put them down on one side. If you do, they’ll still taste fine but won’t look as nice. To serve: Place the grilled endive on a platter. Spoon the sauce over the top and finish with a little squeeze of lime as well. This dish is also great at room temperature. If you serve it that way, wait until the very last moment to add the sauce and then squeeze the lime.